We have all done sportives where it’s felt like a solo time trial, with only the signage for company. Sometimes you might pair-up to share the duties a little bit against the wind. It’s OK, but how much better would it be to ride in a sportive group ride instead? That’s why we’re putting on sportive Group Rides for this year’s White Rose Classic. It is an outgrowth of something we have had on the Event for the last two years: women-only rides. 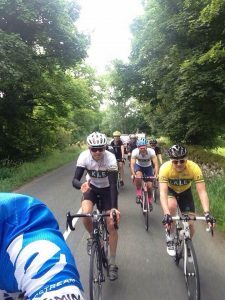 An experienced Ilkley Cycling Club ride leader was at head of the each of the three rides (for the Short, Medium, and Long Routes). Those rides were a resounding success, offering a supportive environment for women who wanted company or a little encouragement in tackling a difficult goal, in what is often, inaccurately, seen as a predominantly male environment. A sportive group ride is not where you learn to climb a hill, or to pedal in a straight line, or gain basic fitness – you should have these things under your belt before you start the White Rose Classic. But you are welcome to join a Group Ride even if you are not comfortable with group riding. On a Group Ride you can also work to enjoy the advantage of a “paceline.” When you ride close enough to someone in front of you, then you will be pulled along in a vacuum. You will go further and faster than you ever could on your own. Although experienced riders make it look effortless, it takes a lot of practice to maintain a close, but constant distance. Once mastered, you’ll gain the trust of riders around you, which is vital to the group dynamic. If you are a strong rider relative to the Group, then you have some additional responsibility. No longer just out for yourself, you may do longer or more frequent turns on the front. You may drop back and help someone who has fallen off the back. But you’ll naturally do this because you want to – you want the group to succeed. For all fitness levels, it is the camaraderie of a group that has worked hard, together, to finish the ride together that gives you satisfaction at the end. Of course, the group dynamic changes as the road tilts up. The climbs! There are lots of them on the White Rose Classic. Even flat parts are lumpy – there is no flat in Yorkshire. Expect several lung-busting climbs, and you’re on your own here – drafting is minimal on a steep climb. At the top, the Group Leader will gather the troops before setting off again. The team is all. When is a Group not a Group? Although the goal of a sportive group ride is to stay together, all elastic has a snapping point. Despite everyone’s best efforts, the group speed may simply be too fast to keep the slowest rider. For each of the three White Rose Classic Routes, there will be rides of three different speeds, “fast,” “average,” and “steady,” where the latter is the slowest. The goal is to try to join the right ride for your capability. If you misjudge your speed you have options. The three rides of different speeds will start one-after-the-other in descending order of speed, approximately fifteen minutes apart. So if you find the pace too high in the fast or average group, you can drop back and look to join the next group behind. If you think a sportive Group Ride might be for you, then click here to put your name down for one of the groups. This does not register you for the White Rose Classic, just for the Group Ride of your choice. If you need to register for the Event itself you can do it here on the British Cycling site. If you are keen to learn more about the protocols and customs of group riding, there is a nice page about club riding on the Ilkley Cycling Club web site. And, of course, there is a lot you can learn about the White Rose Classic itself. Charlie Barnes is an active member of the Ilkley Cycling Club and a frequent Club ride leader.